Certifications - Something feels wrong. Especially interesting is when those same people wanted it to be easier to obtain that certification when they didn't have it. It has become increasingly evident to me that Certifications create a carrot and stick mentality in the people who have them to "inspire" those that don't. The unethical, confrontational, protectionist, command and control, and non inspirational conversations I have seen around certifications has been creating a crisis of character for me. This is because I have many certifications of my own, and I am proud to have them. Is it time for me to cancel all of my certifications so I can focus on collaboration and respect instead of all the noise created by the Certification Industry? I must admit..... I am glad those certifications exist so there is stuff for me to learn. I love to learn. I also truly appreciate those that work to share their knowledge and insight and believe in what they do with passion and conviction. I have many friends and peers who truly care about helping others and making the world a better place. Some of them have certifications, some do not. This to me confirms that the certification does not make the person. I know that for many of my certifications, I obtained them through hard work and a desire to better myself and to get better at helping others. In retrospect, I too have been treated to the carrot and stick. I do not regret this... Maybe I resent it a bit. I haven't worked that out yet. Conversations around who can and who cannot have a certification have a place and a purpose. I get that. It's not that they are wrong.... They just seem to be in opposition to my personal goals of helping others rather than restricting them. 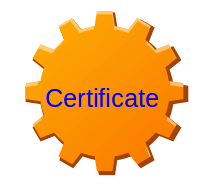 I also understand and appreciate that Certification is a form of protection for unsuspecting people or organizations to not be taken advantage of in their pursuit of knowledge or help. When, I'm buying, it's important for me to have an idea what I'm getting. I am glad that people can have some confidence in my help through the certifications that I have. This puts them somewhat at ease which can help a relationship (and my ability to help them) significantly. Which is why... I honestly haven't decided yet. I do know .... it would make me happier to see people being treated better and with respect. People are not cattle to be "attained"... People should be served.